Welcome to Visible Monday #165. If you want to participate, it’s so easy: just go to the bottom of this post for the how-to. Please be kind and leave a link to Not Dead Yet Style in your post. You haven’t seen much vivid orange in my wardrobe over the years. In fact, it’s on my “no” list. Well haha on me, I found this vintage 80’s Evan Piccone sack dress (similar) at the thrift for a couple of dollars, and I had to try it. It’s not my best color, as I have “cool” undertones, but I do like the shape and the overall statement (“I am not afraid of orange”). I added a vintage pearl and tassel necklace (sim) and a gorgeous bracelet from Bella’s Etsy shop. The Cydwoq booties (sim) add a funky feel. My custom lipstick picks up the orange in the dress. 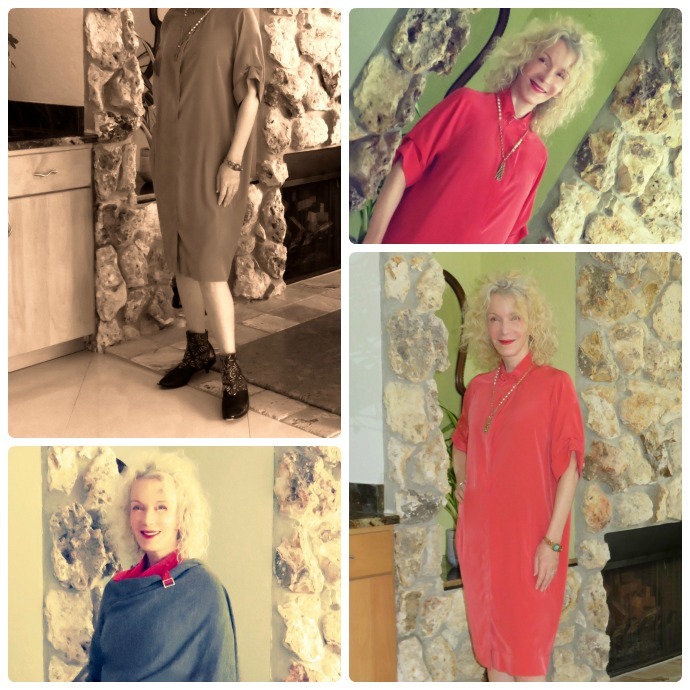 In the lower photos, I threw on a wool wrap (sim), just in case it ever gets cool in Florida. I like the cool gray wrap against the bright warm orange. Thank you for hosting this great party. Love that shade of orange / coral and, as always, you look great. Gah! That dress is amazing on you. And the styling is perfection!! Orange really does look gorgeous on you! As always, thanks for hosting. You look very good in orange. Did you add a belt to the look for a bit more shape? I love how you have fun with your outfits rather than sticking to a boring uniform. That is a COOL orange, I call it Blood Orange. No wonder you like it. I’m a cool pallette like you and usually avoid orange like the plague, but I have a sweater the color of your dress and it works! Great look and I can’t believe you found that at the thrift. Great looK! I love adding a pop of color or pattern to each outfit! I love your red dress, Patti – I wore my magenta cocoon dress and it’s so freeing to be all loose for a change. I especially like the neckline of yours…! Please note that I always refer to Visible Monday in my latest post. Not necessarily in the post I add to the link-up. The latest post gets more readers… ergo. This dress is really lovely on you. Whether you think orange is your colour or not, it looks so nice. 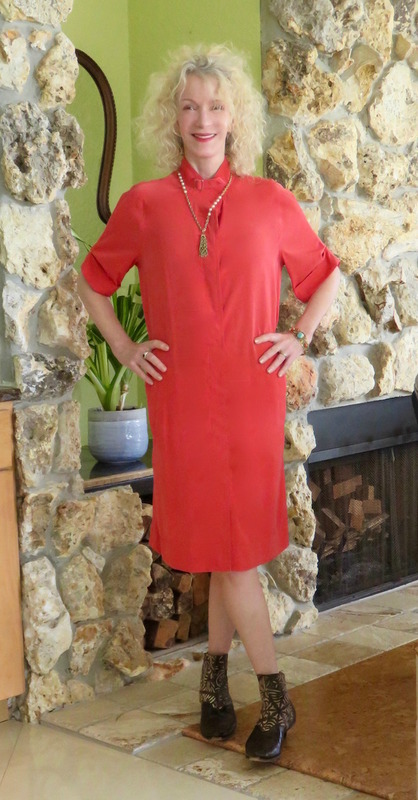 I will add my red/orange tunic dress to the link-up. I’m not sure what I like better: the word “sack dress” or the dress itself. You look fantastic in orange and I’m glad you gave this colour another chance. The wrap looks great too – good to have just in CASE! Thanks so much for the invitation. The finger sandwiches are divine – you simply MUST give me the recipe. What an awesome dress! I am a huge fan of this look – great that you took that big step towards bold colors. Suits you soooo well. Definitely one of my favourite looks on you!! What a lovely dress! I love coral and think it looks great on so many skin tones. Very cool with those boots! Love the lipstick too, I have a craving for a new shade. I love coral anything! The cut of that dress is right up my alley! Love the booties to mix it up too. Have a wonderful Monday! ooo Orange. I luv Orange these days. And it looks good on you, no matter what you used to say/ think. Is it linen? Nice style. And with the boots, very groovy. Bright bold colors suits you Patti! Come join the RAY-BAN GIVEAWAY I am hosting at the blog for SUNGLASSES SHOP from Nov. 16-22! Patti, I love that color on you! Thanks again for hosting Visible Monday. That’s a gorgeous color on you! Love how you styled that dress with booties. I think you can do bright colours well. I love that bright lippy with it. This is a great find. I’d like to see what it looks like belted too. You know I love bold colors. That orange red Shirtdress is beautiful, Patti. I think people can wear any colour – it’s just finding the right tone. I do think the citrus colours of orange and yellow are the hardest as they can be quite jarring against some skin tones but this is wonderful on you, Patti. And I love how you’ve kept the dress simple but then added some truly wicked boots! Forget about undertones…this bright orange is so gorgeous on you Patti! And those booties are to die for. In my post today I’m talking about undertones and the fact that I just go with the colors that make me feel good; orange should definitely be one of those colors for you! Bold colour looks good on you Patti. The shape suits you so well and works so well with your great boots. Hello dear Patti, bold colours is my name, lol. You look fabulous in red. Patti, I love this colour on you and the style works a dream on your slim figure. Most of all though, I covet these boots and hope you will keep me in mind if you ever get bored of them! As you will see by my link up, I’m a huge fan of bold colours too. Beautiful colour and the dress is definitely worth giving it a chance. Looks great! The boots are really cool and I love the jewelry! I love how much fun the boots add to this outfit! Wow, I love the colour and the less-structured shape of this dress – it’s just fabulous on you, Patti! Brava for stretching the boundaries of your colour world! I’ll be joining up shortly! This is such a chic shirtdress on you and love the vibrant colour! Yep, I agree with the others so far, the color is fantastic and it looks wonderful on you. Plus you were right, the fit and style was worth the purchase (even if it had been retail price). Perfect choice of footwear with this fun dress and the grey wrap does bring in the added warmth of color. I love that orange/red color! And it looks really cool with the charcoal gray too! Thanks for the link up, Patti! Thank coral color is lovely, Patt! Thanks for the link up! I love the color of the dress, and I think it looks really good on you. Those boots are amazing! Here we’ve gone all muted on you (the first few participants at least) and you are ROCKIN that coral color! I own a dress very similar to yours. However mine is in a powder blue. I’m also playing around with styling options.